Ankara ( ; [ˈaŋkaɾa]), formerly known as Ancyra (Greek: Ἄγκυρα) and Angora, is the capital of the Republic of Turkey. 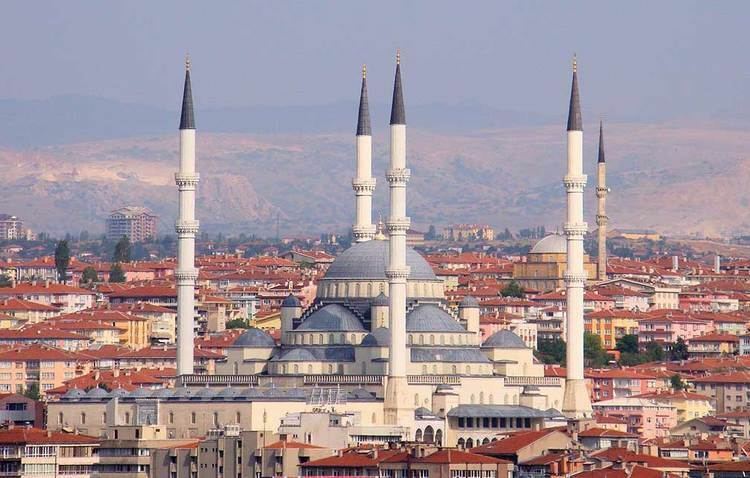 With a population of 4,587,558 in the urban center and 5,150,072 in its province , it is Turkey's second largest city after former imperial capital Istanbul, having overtaken İzmir. The former Metropolitan archbishopric remains a triple titular see (Latin, Armenian Catholic and Orthodox). Ankara was Atatürk's headquarters from 1920 and has been the capital of the Republic since the latter's founding in 1923, replacing Istanbul (once the Byzantine capital Constantinople) following the fall of the Ottoman Empire. The government is a prominent employer, but Ankara is also an important commercial and industrial city, located at the center of Turkey's road and railway networks. The city gave its name to the Angora wool shorn from Angora rabbits, the long-haired Angora goat (the source of mohair), and the Angora cat. The area is also known for its pears, honey and muscat grapes. Although situated in one of the driest places of Turkey and surrounded mostly by steppe vegetation except for the forested areas on the southern periphery, Ankara can be considered a green city in terms of green areas per inhabitant, at 72 square metres (775 square feet) per head. The city is well known during the 4th century as a centre of Christian activity (see also below), due to frequent imperial visits, and through the letters of the pagan scholar Libanius. Bishop Marcellus of Ancyra and Basil of Ancyra were active in the theological controversies of their day, and the city was the site of no less than three church synods in 314, in 358, and in 375, the latter two in favour of Arianism. The city was visited by Emperor Constans I (r. 337–350) in 347 and 350, Julian (r. 361–363) during his Persian campaign in 362, and Julian's successor Jovian (r. 363–364) in winter 363/364 (he entered his consulship while in the city). After Jovian's death soon after, Valentinian I(r. 364–375) was acclaimed emperor at Ancyra, and in the next year his brother Valens(r. 364–378) used Ancyra as his base against the usurper Procopius. When the province of Galatia was divided sometime in 396/99, Ancyra remained the civil capital of Galatia I, as well as its ecclesiastical centre (metropolitan see). Emperor Arcadius (r. 395–408) frequently used the city as his summer residence, and some information about the ecclesiastical affairs of the city during the early 5th century is found in the works of Palladius of Galatia and Nilus of Galatia. In 479, the rebel Marcian attacked the city, without being able to capture it. In 610/11, Comentiolus, brother of Emperor Phocas (r. 602–610), launched his own unsuccessful rebellion in the city against Heraclius (r. 610–641). Ten years later, in 620 or more likely 622, it was captured by the Sassanid Persians during the Byzantine–Sassanid War of 602–628. Although the city returned to Byzantine hands after the end of the war, the Persian presence left traces in the city's archaeology, and likely began the process of its transformation from a late antique city to a medieval fortified settlement. In 654, the city was captured for the first time by the Arabs of the Rashidun Caliphate, under Muawiyah, the future founder of the Umayyad Caliphate. At about the same time, the themes were established in Anatolia, and Ancyra became capital of the Opsician Theme, which was the largest and most important theme until it was split up under Emperor Constantine V (r. 741–775); Ancyra then became the capital of the new Bucellarian Theme. The city was attacked without success by Abbasid forces in 776 and in 798/99. In 805, Emperor Nikephoros I (r. 802–811) strengthened its fortifications, a fact which probably saved it from sack during the large-scale invasion of Anatolia by Caliph Harun al-Rashid in the next year. Arab sources report that Harun and his successor al-Ma'mun (r. 813–833) took the city, but this information is later invention. In 838, however, during the Amorium campaign, the armies of Caliph al-Mu'tasim (r. 833–842) converged and met at the city; abandoned by its inhabitants, Ancara was razed to the ground, before the Arab armies went on to besiege and destroy Amorium. In 859, Emperor Michael III (r. 842–867) came to the city during a campaign against the Arabs, and ordered its fortifications restored. In 872, the city was menaced, but not taken, by the Paulicians under Chrysocheir. The last Arab raid to reach the city was undertaken in 931, by the Abbasid governor of Tarsus, Thamal al-Dulafi, but the city again was not captured. After the Battle of Manzikert in 1071, the Seljuk Turks overran much of Anatolia. By 1073, the Turkish settlers had reached the vicinity of Ancyra, and the city was captured shortly after, at the latest by the time of the rebellion of Nikephoros Melissenos in 1081. In 1101, when the Crusade under Raymond IV of Toulouse arrived, the city had been under Danishmend control for some time. The Crusaders captured the city, and handed it over to the Byzantine emperor Alexios I Komnenos (r. 1081–1118). Byzantine rule did not last long, and the city was captured by the Seljuk Sultanate of Rum at some unknown point; in 1127, it returned to Danishmend control until 1143, when the Seljuks of Rum retook it. However, the persecution proved unsuccessful and in 314 Ancyra was the center of an important council of the early church; its 25 disciplinary canons constitute one of the most important documents in the early history of the administration of the Sacrament of Penance. The synod also considered ecclesiastical policy for the reconstruction of the Christian Church after the persecutions, and in particular the treatment of lapsi—Christians who had given in to forced paganism (sacrifices) to avoid martyrdom during these persecutions. In 1735 an Armenian Catholic diocese was established (Curiate Italian: Ancira degli Ameni). Having fallen into disuse, on 1850.04.30 it was restored. Mikail Nersès Sétian (1981.07.03 – death 2002.09.09), as Apostolic Exarch of United States of America and Canada of the Armenians (USA) (1981.07.03 – retired 1993.09.18) and as emeritate. The foundations of the Ankara castle and citadel were laid by the Galatians on a prominent lava outcrop (39.941°N 32.864°E﻿ / 39.941; 32.864), and the rest was completed by the Romans. The Byzantines and Seljuks further made restorations and additions. The area around and inside the citadel, being the oldest part of Ankara, contains many fine examples of traditional architecture. There are also recreational areas to relax. Many restored traditional Turkish houses inside the citadel area have found new life as restaurants, serving local cuisine. 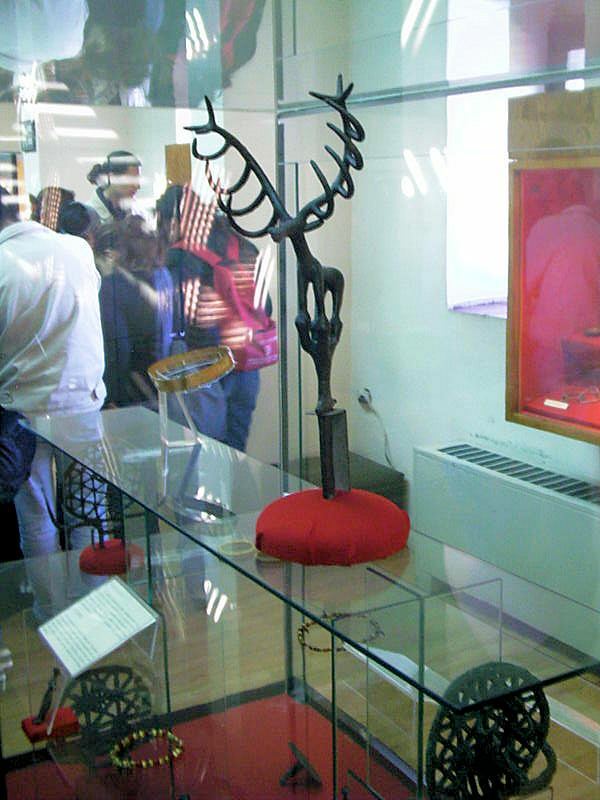 The Museum of Anatolian Civilizations (Anadolu Medeniyetleri Müzesi) is situated at the entrance of the Ankara Castle. It is an old 15th century bedesten (covered bazaar) that has been beautifully restored and now houses a unique collection of Paleolithic, Neolithic, Hatti, Hittite, Phrygian, Urartian and Roman works as well as a major section dedicated to Lydian treasures. Ankara has a hot-summer Mediterranean climate (Csa) under the Köppen climate classification. Under the Trewartha climate classification, Ankara has a middle latitude steppe climate (BSks). Due to its elevation and inland location, Ankara has cold, snowy winters and hot, dry summers, with cool nightly temperatures. Rainfall occurs mostly during the spring and autumn. Ankara lies in USDA Hardiness zone 7b, and its annual average precipitation is fairly low at 400 millimeters (16 in), nevertheless precipitation can be observed throughout the year. Monthly mean temperatures range from 0.3 °C (32.5 °F) in January to 23.5 °C (74.3 °F) in July, with an annual mean of 12.02 °C (53.6 °F). The average amount of time people spend commuting with public transit in Ankara, for example to and from work, on a weekday is 71 min. 17% of public transit riders, ride for more than 2 hours every day. The average amount of time people wait at a stop or station for public transit is 16 min, while 28.% of riders wait for over 20 minutes on average every day. The average distance people usually ride in a single trip with public transit is 9.9 km, while 27% travel for over 12 km in a single direction.